Like the old song says, it’s the most wonderful time of the year! Christmas and New Year’s are almost here, and we’re egg-cited for this merry season of gift-giving and playing out in the snow! 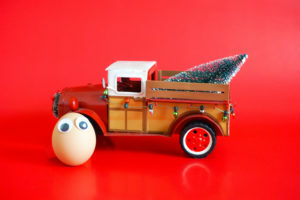 What other fest-egg things do we Noah’s Pride Eggs love to do in the holiday season? 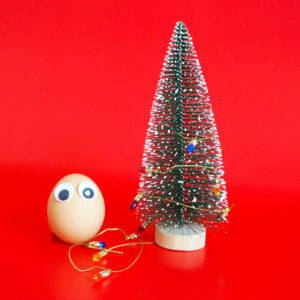 Some people like to put up artificial Christmas trees, but not the Noah’s Pride Eggs! We prefer to bundle up together and choose a tree to cut down ourselves at a local tree farm. Did you know that our home state of Pennsylvania is one of the top Christmas tree growing states in the whole United States? It can be eggs-tremely hard to pick out just the right tree from all those choices! Once we have our tree home and all set up, it’s time to d-egg-orate! We spend a day decking out the tree with colorful twinkle lights and special ornaments that have been in our family for years and years. We also sing Christmas carols (like “Go Shell it On the Mountain” and “Egg White Christmas”) tell stories, and just enjoy our family time together! When the tree is almost no longer visible under the lights and garlands and ornaments, we take some time to admire our work. Mama bakes some cookies, pours us all a glass of Kreider’s Egg Nog, and we eggs make a toast to a job well done! Give (and get) tons of gifts! Is your favorite part of the holiday season giving and getting gifts? It sure is ours! 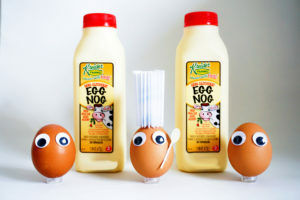 The Egg Family is known around town for our eggs-travagant parties we throw for all of our friends and eggs-tended family members. We feast and share surprises and make sure everyone goes home with a load of gifts! You can guarantee there is never a rotten egg in our carton! While we don’t always have the egg white Christmas that everybody hopes for, we know that snow will almost certainly fall in the New Year. As winter takes hold, we egg-citedly wait for those big, fat flakes to fall from the sky so we can spend time outdoors frolicking in the snow! We always go sledding, have snowball fights, and make snowmen, (though snow egg angels aren’t really a thing)! 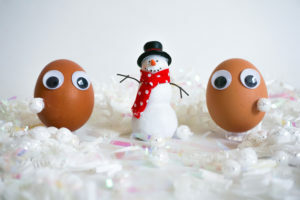 Of course, we do like to build egg-loos! Have an indoor snow day! Sometimes when the snow just won’t stop falling, and school and work are canceled, we enjoy a good old-fashioned indoor snow day! It’s fun to lay around in our pajamas and enjoy our favorite candy and Kreider’s treats by the fire – as long as we’re careful not to get hard boiled! 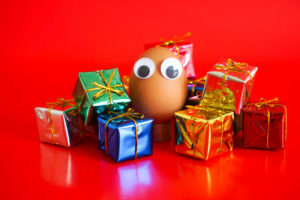 How do you cel-egg-brate the holidays? Tag us on Facebook and Instagram and share your family’s holiday traditions! We love to hear from our fans and followers! At Noah’s Pride, we care about our hens and we care about your food! Pick up our eggs-tra special eggs on your next shopping trip… and save with this special offer – our holiday gift to you!